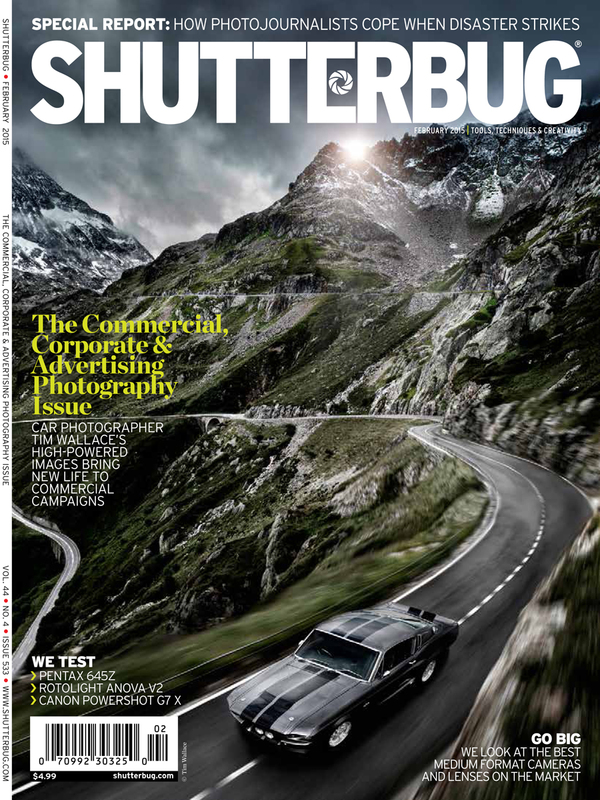 Shutterbug Magazine in the US is arguably one of the largest photography magazines in the US and this week saw the publication of the 2015 February edition that features a front cover shot from commercial car photographer Tim Wallace of AmbientLife along with a in-depth Pro interview where Tim talks to Shutterbug about his early beginnings, business and how he approaches the market as well as technique. I've been following Tim Wallace on Facebook for some time now. The guy seems to have an endless supply of gorgeous photos of cars. And not just any cars. We’re talking Aston Martins, Jaguars, Ferraris, Lambos, and more. The cars pimply-faced teen boys drool over and Paris Hilton’s buddies roar down Ocean Drive on most Saturday nights. A visit to his impressive website (www.ambientlife.co.uk) reveals beautifully crafted Jaguar wheels, a Shelby GT500 gleaming in an industrial setting, an Aston Martin DBS carving through the mountain switchbacks in Switzerland, and more. All of the images reflect Wallace’s fastidious attention to detail, superb image quality, and, above all, his lighting mastery that turns automobiles into rolling pieces of sculpture. So how does Wallace manage to stay busy shooting cars and yachts all over Europe and the US? 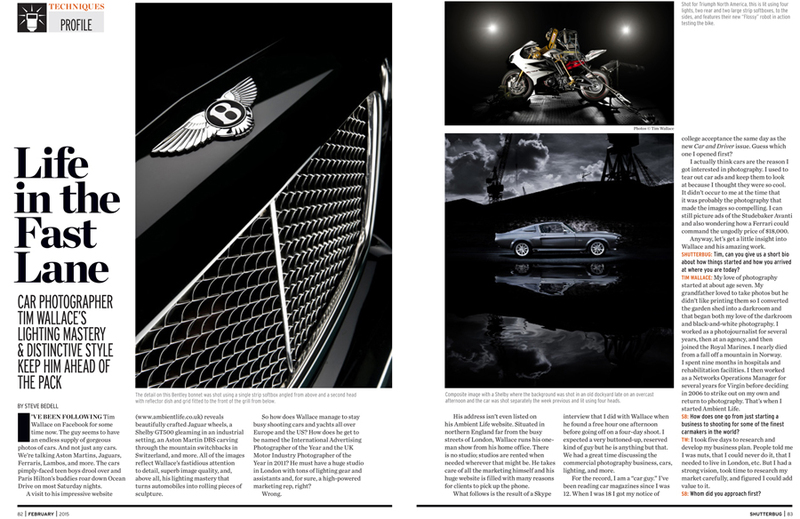 How does he get to be named the International Advertising Photographer of the Year and the UK Motor Industry Photographer of the Year in 2011? He must have a huge studio in London with tons of lighting gear and assistants and, for sure, a high-powered marketing rep, right? Wrong. His address isn’t even listed on his Ambient Life website. Situated in northern England far from the busy streets of London, Wallace runs his one- man show from his home office. There is no studio; studios are rented when needed wherever that might be. He takes care of all the marketing himself and his huge website is filled with many reasons for clients to pick up the phone. What follows is the result of a Skype interview that I did with Wallace when he found a free hour one afternoon before going off on a four-day shoot. I expected a very buttoned-up, reserved kind of guy but he is anything but that. We had a great time discussing the commercial photography business, cars, lighting, and more. For the record, I am a “car guy.” I’ve been reading car magazines since I was 12. When I was 18 I got my notice of college acceptance the same day as the new Car and Driver issue. Guess which one I opened first? I actually think cars are the reason I got interested in photography. I used to tear out car ads and keep them to look at because I thought they were so cool. It didn’t occur to me at the time that it was probably the photography that made the images so compelling. I can still picture ads of the Studebaker Avanti and also wondering how a Ferrari could command the ungodly price of $18,000. Anyway, let’s get a little insight into Wallace and his amazing work. 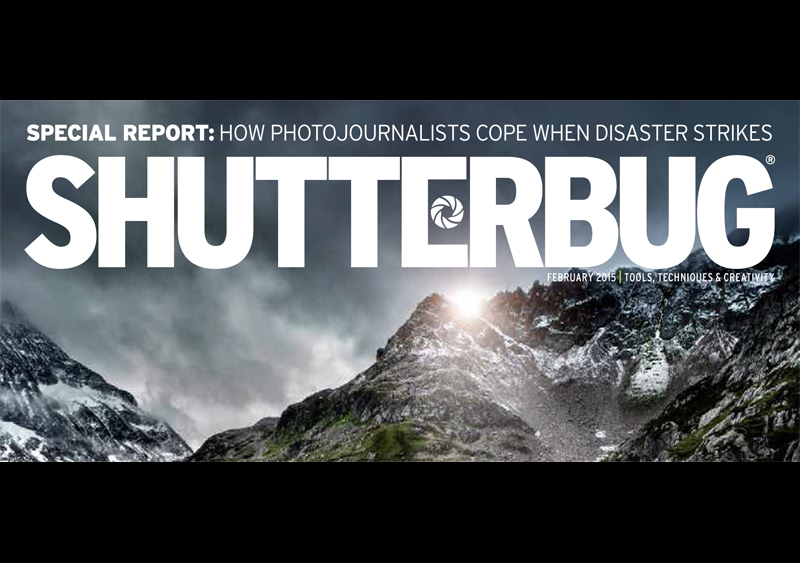 SHUTTERBUG: Tim, can you give us a short bio about how things started and how you arrived at where you are today? TIM WALLACE: My love of photography started at about age seven. My grandfather loved to take photos but he didn’t like printing them so I converted the garden shed into a darkroom and that began both my love of the darkroom and black-and-white photography. I worked as a photojournalist for several years, then at an agency, I then worked as a Networks Operations Manager for several years for Virgin before deciding in 2006 to strike out on my own and return to photography. That’s when I started Ambient Life. 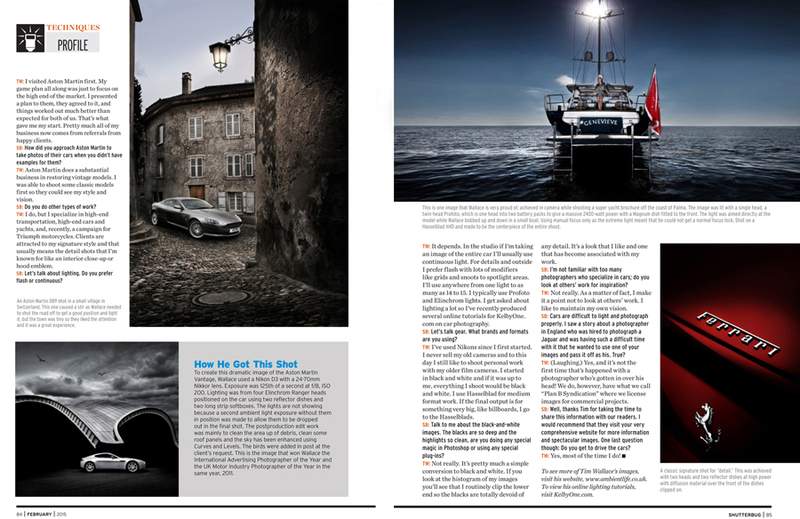 SB: How does one go from just starting a business to shooting for some of the finest carmakers in the world? TW: I took five days to research and develop my business plan. People told me I was nuts, that I could never do it, that I needed to live in London, etc. But I had a strong vision, took time to research my market carefully, and figured I could add value to it. SB: Whom did you approach first? TW: I visited Aston Martin first. My game plan all along was just to focus on the high end of the market. I presented a plan to them, they agreed to it, and things worked out much better than expected for both of us. That’s what gave me my start. Pretty much all of my business now comes from referrals from happy clients. SB: How did you approach Aston Martin to take photos of their cars when you didn’t have examples for them? TW: Aston Martin does a substantial business in restoring vintage models. I was able to shoot some classic models first so they could see my style and vision. SB: Do you do other types of work? TW: I do, but I specialize in high-end transportation, high-end cars and yachts, and, recently, a campaign for Triumph motorcycles. Clients are attracted to my signature style and that usually means the detail shots that I’m known for like an interior close-up or hood emblem. SB: Let’s talk about lighting. Do you prefer flash or continuous? TW: It depends. In the studio if I’m taking an image of the entire car I’ll usually use continuous light. For details and outside I prefer flash with lots of modifiers like grids and snoots to spotlight areas. I’ll use anywhere from one light to as many as 14 to 15. I typically use Profoto and Elinchrom lights. I get asked about lighting a lot so I’ve recently produced several online tutorials for KelbyOne. com on car photography. SB: Let’s talk gear. What brands and formats are you using?? TW: I’ve used Nikons since I first started. I never sell my old cameras and to this day I still like to shoot personal work with my older film cameras. I started in black and white and if it was up to me, everything I shoot would be black and white. I use Hasselblad for medium format work. If the final output is for something very big, like billboards, I go to the Hasselblad's. ?SB: Talk to me about the black-and-white images. The blacks are so deep and the highlights so clean, are you doing any special magic in Photoshop or using any special plug-ins?? TW: Not really. It’s pretty much a simple conversion to black and white. If you look at the histogram of my images you’ll see that I routinely clip the lower end so the blacks are totally devoid of any detail. It’s a look that I like and one that has become associated with my work.? SB: I’m not familiar with too many photographers who specialize in cars; do you look at others’ work for inspiration? TW: Not really. As a matter of fact, I make it a point not to look at others’ work. I like to maintain my own vision.? SB: Cars are difficult to light and photograph properly. I saw a story about a photographer in England who was hired to photograph a Jaguar and was having such a difficult time with it that he wanted to use one of your images and pass it off as his. True? TW: (Laughing.) Yes, and it’s not the?first time that’s happened with a photographer who’s gotten in over his head! We do, however, have what we call “Plan B Syndication” where we license images for commercial projects. SB: Well, thanks Tim for taking the time to share this information with our readers. I would recommend that they visit your very comprehensive website for more information and spectacular images. One last question though: Do you get to drive the cars? TW: Yes, most of the time I do!